I don’t usually have much empty space in my garden this time of year. 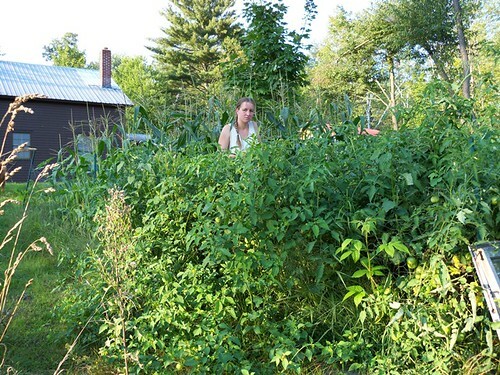 But what with the total loss of tomatoes and corn almost half my garden is bare. Luckily there is still time to plant a fall garden. In amongst the sunflowers* I’ve planted rows of carrots (65-70 days) onions (60 days) and beets (55 days) as well as swiss chard (45 days). This is my first time with root crops. I’m hoping the soil is finally soft enough, and deep enough, for some good ones! 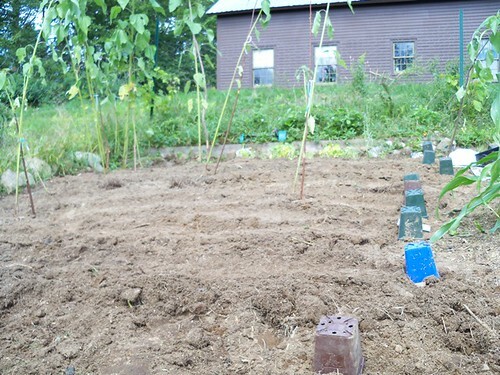 But I also planted bunching onions, little finger carrots, and small beets, so I’m not trying anything full sized yet. 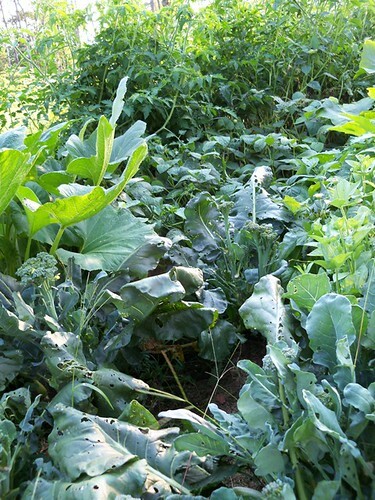 Below the root crops are broccoli (55 days), and little pattypan squashes (60 days). 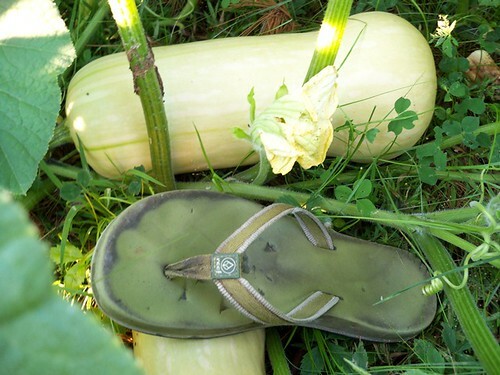 Pattypans are little UFO shaped summer squashes that you can eat when they’re still tiny. 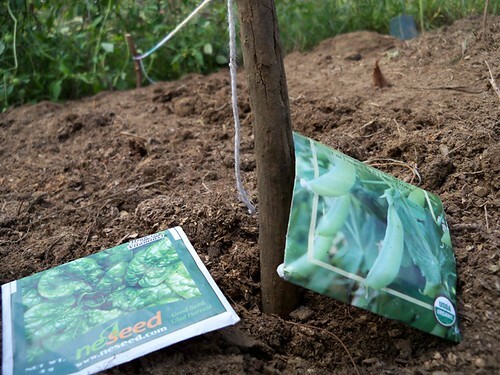 Next I have two rows of peas (63 days) and spinach (45 days). 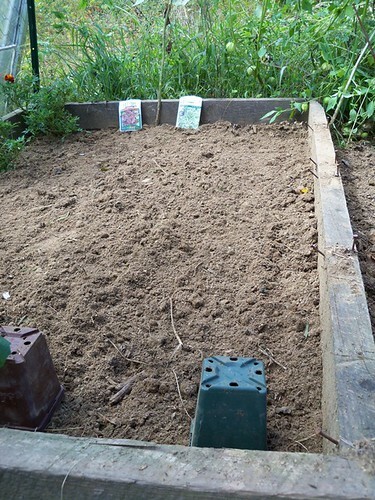 And finally, in the box at the bottom of the garden, red and green lettuce (45 and 50 days). I’ll put up the windows for the a-frame and with any luck we’ll have lettuce well into the winter again this year. Those days? Those are the days until maturity for the plants I’m growing. Our average first frost comes around the end of september (31 days) so maybe I’m cutting things a little close. But a lot of these plants can handle a light frost, and some of them honestly like the cooler temps better! 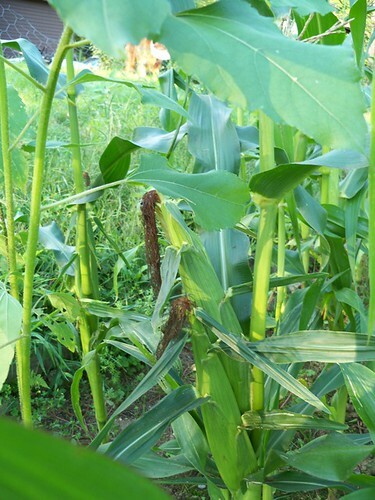 *the sunflowers used to be in amongst the corn. Where the corn stalks snapped in the wind, the sunflowers just bent over. 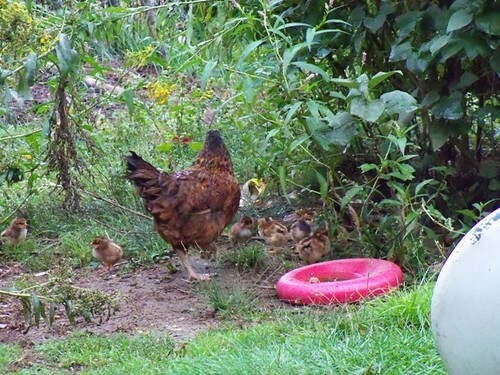 I’ve staked them up and they seem pretty happy! 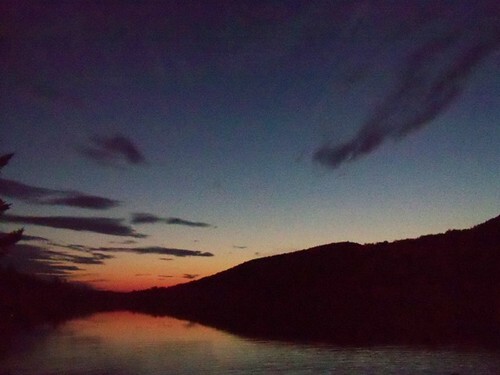 Vermont continues to try and regroup after the hurricane. It wasn’t the winds so much as the flooding which has knocked so many flat. I’m still not at work. Some buildings in Waterbury had feet of water on the first floor (my yoga studio, for instance is closed until further notice) The state complex includes many basement offices and I have no idea when they’ll be asking us to return to work. But I’m thankful. I’m glad not to be in any of the dozen communities which are completely cut off from everyone. I’m grateful for them that there will be helicopter deliveries of food and supplies to those places soon. I’m thankful my electric coop (one of the smaller companies, but covering the largest area) was organized enough to get my power back on yesterday. I’m especially thankful to have today with electricity so I can get my corn off the stocks, blanched, and frozen. I even rescued the baby corn. I’d never tried picking it before, it always seems like such a waste. 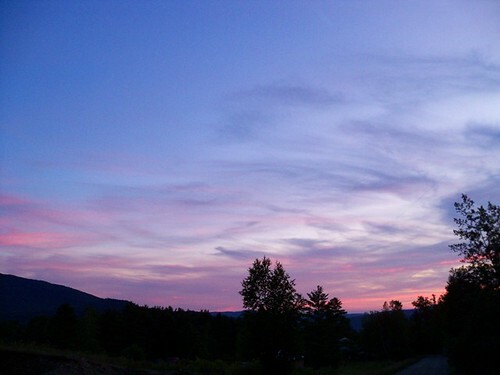 We’ve survived hurricane Irene high and (relatively) dry up here on the slopes of the green mountains. The same can not be said for friends down in the valleys. All over vermont rivers are jumping their banks (again) flooding small villages and washing out roadways. I’ve heard of at least three covered bridges that have been washed down stream. The sadness of loosing those beautiful old buildings is not tempered, just dulled, but the more essential losses of homes and businesses elsewhere. All I’ve lost is my sweet corn. I need to get out there and harvest the ears that were already ripe so I can get them into the freezer before they rot on the stalks. You know you want my monkey shirt! 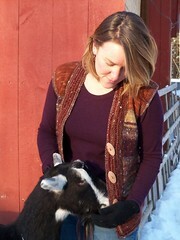 You can see all the photos, and find the pattern on Ravelry, as always. 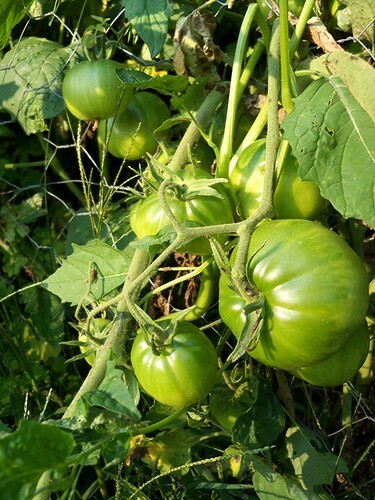 Four days ago, when I checked in on my garden, my tomatoes looked fine. I went down yesterday evening to find blight. 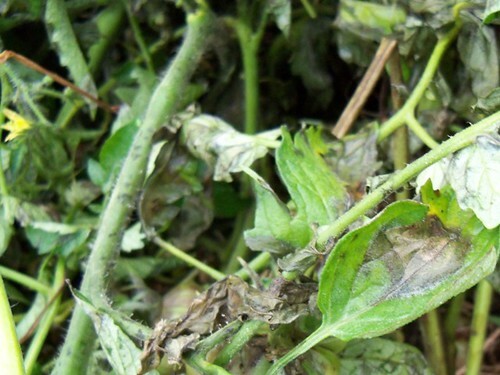 The late blight was everywhere, and it was bad. It probably started on the understory leaves so maybe it was there 4 days ago and i just didn’t see it. But they were brown and wilting right to the tips last night, every one of my 24 plants. 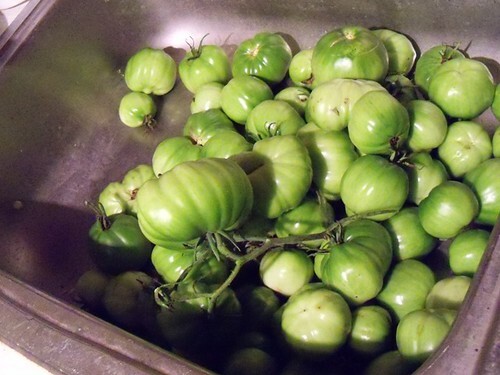 and a bag full of green tomatoes. I salvaged the fruit that wasn’t yet spotted. Maybe 1/4 of what was on the plants, maybe less. I will have to buy all my tomatoes for sauce this year, and I’m sure it’s my own fault. The ground never froze solid last winter because of all the snow, we had such a wet, rainy spring. 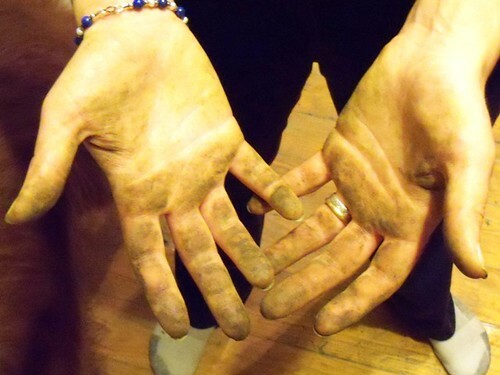 I didn’t prune the plants to allow enough air to circulate – because they’re determinate plants and I didn’t want to prune off buds and loose some of my harvest. 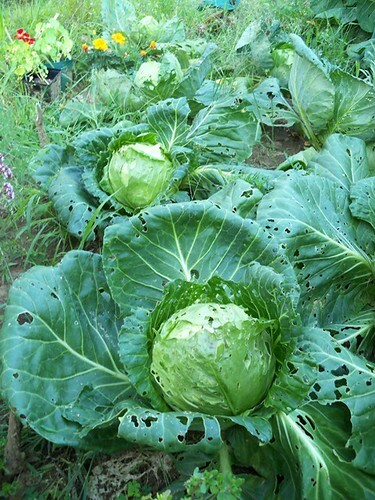 Live and learn, except I’ve had blight before, and it was never this bad, so I never did learn. 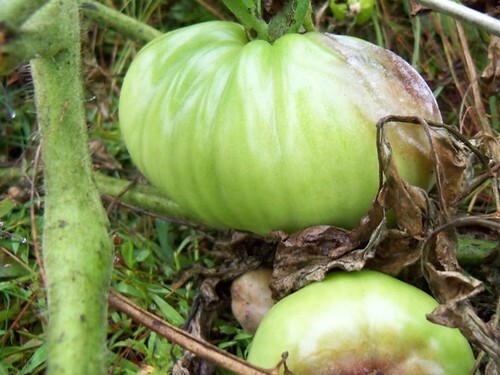 I might skip tomatoes next year too, because the spores must be thick in the soil now from all those plants. If you look at those last two you can see tiny feet sticking out at funny places. 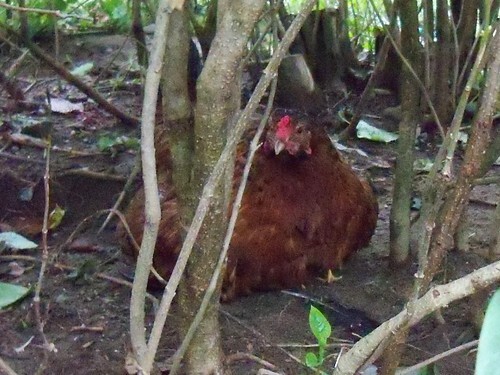 We can’t get close enough to do a head count, but I’d guess she has at least 12 chicks, and wouldn’t be surprised if there were 18. 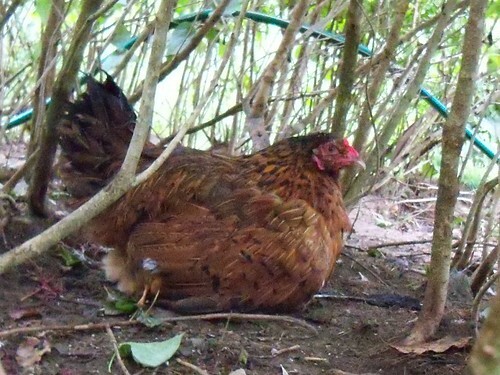 Although I am surprised she managed to hatch that many, she’s not a very big hen! The babies are 2 days old and she can barely fit them all under her. In a week when they’ve all started growing she’s gonna be in trouble! And the third August design is with my tech editor right now. This puts me back on track for having the collection done by the end of September or beginning of October. Although if I want to release 3 in September I really had better start with their layout and charting. I need some quality time with my computer, and this time of year is so busy in the garden and with visiting people! Still, I’ll make the time, I’m sure. But what will I knit next? I have another design making it’s presence known in my brain which may come out of my head and onto my needles soon enough. 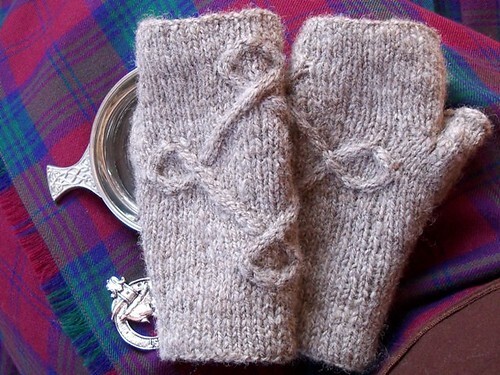 But while I’m finishing the computer work for these I’ll be in knitting down-time. I love working other people’s designs. My current plan is to put serious effort into my Gwen cardigan. I have the fronts half finished. Once I complete them it’s just the button band, collar, and seaming! My goal is to be done with it for Rhinebeck. 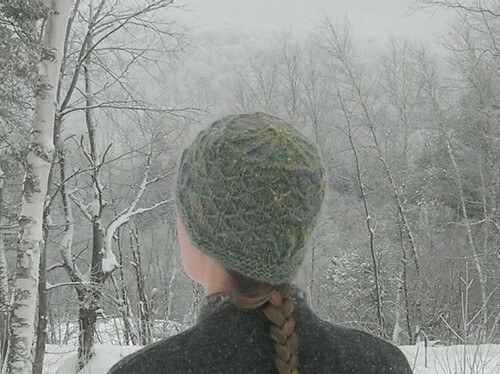 I have a number of designs published for use with handspun* some with Ennea, one with Knittyspin, and my own patterns as well. But I understand that plenty of knitters are not spinners. Knitters who might not want to deal with the headache, and potential heart ache, of trying to substitute a commercial yarn for a handspun. The yarn here is a plied, smooth, pure wool, perfect for making cables pop. This is a much more simple swap. We can all name some good yarns for cables like Bartlett, Wool of the Andes, Quince and Co’s Lark… But for these mitts I’m recommending Peace Fleece worsted. In spite of the mohair this yarn is still very smooth, and the heathered colors make it A) gorgeous and B) a closer match to the subtle variation in the original handspun I used. So while it’s not as intuitive a substitution (and don’t get me wrong, any good cabling yarn will work wonderfully) I have put a lot of thought into what will give you: the non-spinning knitter, a similar result to my original intentions. It’s 4oz of superwash BFL and I love the mossy greens and pale blues. 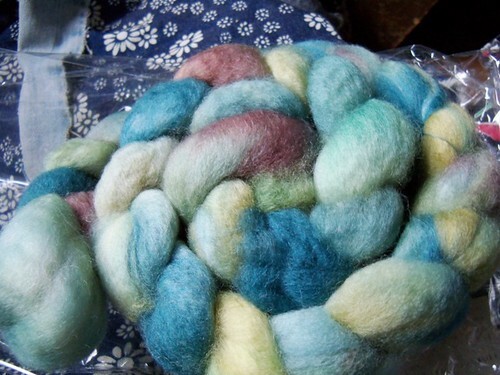 I especially love it for the variety it brings to my spinning stash. (most of my stash is either natural white or brown, or the brights that come from food dye colors) You should check out her roving, I love all the colors so much! If you’re not a spinner you should still check out her store, she’s got some really lovely yarns too. 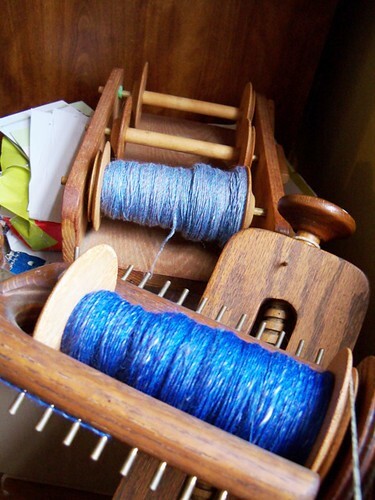 when I’m finally done and the two shades of blue are plied I think this yarn will need to be the yoke of a sweater. Maybe I’ll design something special! and you can be sure I’ll make a substitution recommendation. 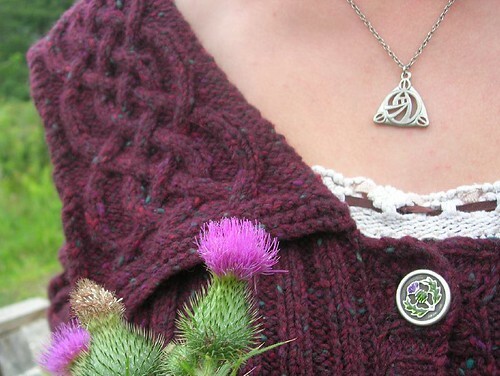 *all my patterns can be found any time you want through the links at the top of my blog. **This should totally be a real word. Last night for dinner I had my first three ears of Ashworth corn. It tasted corn-y. As if all the other corn on the market were just watered down a bit. The flavor was nutty, rich, with just a hint of sweetness. That’s right, in spite of the intensity of the flavor it was less sweet than most corn (I’ve been ignoring the super-sweet stuff for years) The best example I can think of is the difference between store-bought eggs and day old fresh eggs from completely free range chickens. I don’t think I’m ever going back*. 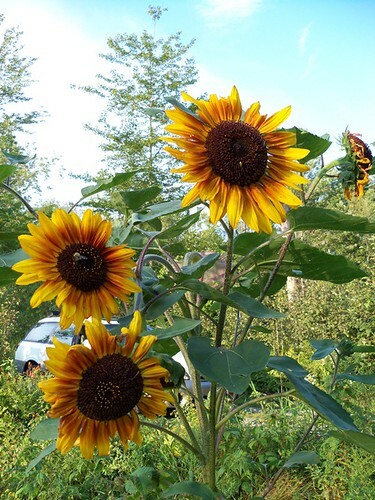 Ashworth is an open pollinating variety, not a more modern hybrid. And yes these older varieties have a lot more starch, and don’t keep once picked for very long. Last night I actually started the water boiling before I went to pick the corn. Tonight I’m planning a taste test where I pick some, start the water, pick the rest and then compare to see how much of a difference it makes. But this variety it still matures in plenty of time for a Vermont garden. The ears are smaller than hybrids, I’d say 7 or maybe 8″ long. But the plants can have 2 or even 3 ears each. *ok, that’s a lie. 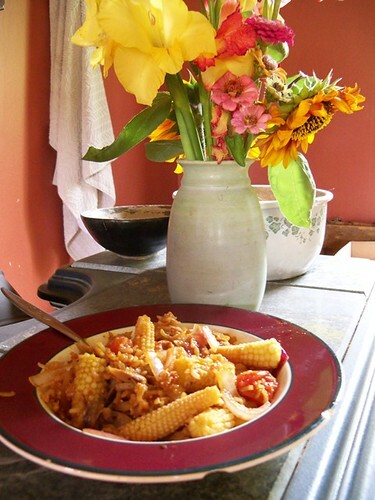 I’ll still happily take the CSA corn, even if it isn’t quite as tasty. And you’d probably be laughing if you could see what I had to do to get over the garden fence (the only thing holding up those tomatoes) and behind those plants before the autotimer took that picture! 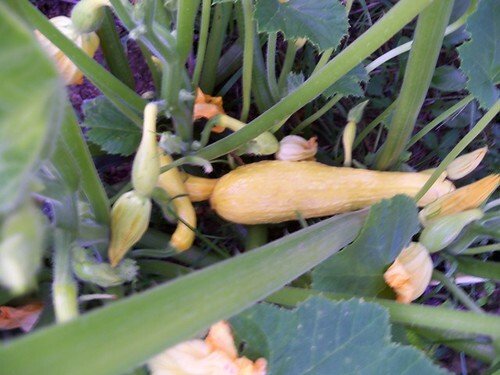 And the winter squash? Yeah, I’ve got those too, with a sandal for comparision! I’ve got another 6 or 8 butternuts like that one. I’m not sure what happened to the buttercups, I don’t see any of them. Maybe they lost their battle with the tomato plants… The acorn squash are doing fine, although one vine went rogue and is busy crushing the bush beans… I’m a little confused about those because I KNOW I planted cranberry shelling beans, and I KNOW all my bean seeds germinated. But I don’t see any with the pretty pink spots. It may be that my seed-saving has gotten the better of me and they cross pollinated with something last year. I like those beans so much I’ll just have to find a source for new seed next spring. 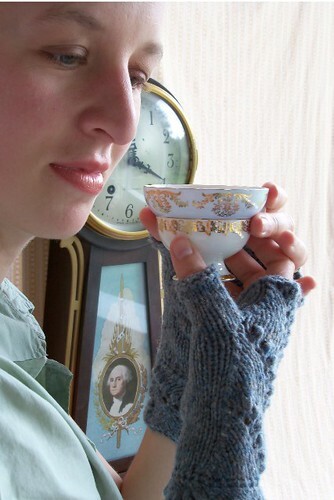 I’d like to introduce Tea Time, the next pattern in the Time on my Hands e-book! 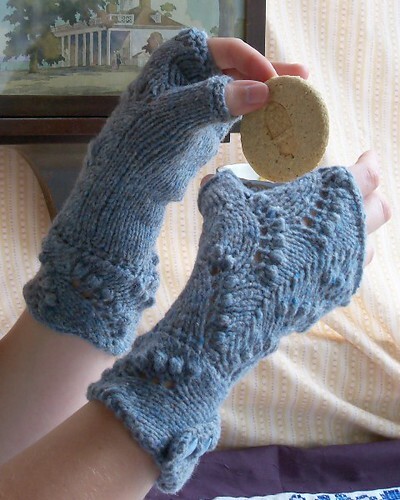 These pretty little fingerless mitts are one of the original designs that came knocking on the doorstep of my brain when the idea for this collection was conceived. 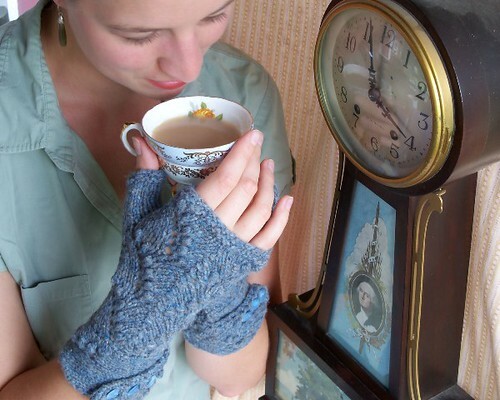 I knew I wanted tea time mitts, rush hour driving gloves*, and cuckoo clock mittens. The yarn here is Brooklyn Tweed’s Shelter yarn. 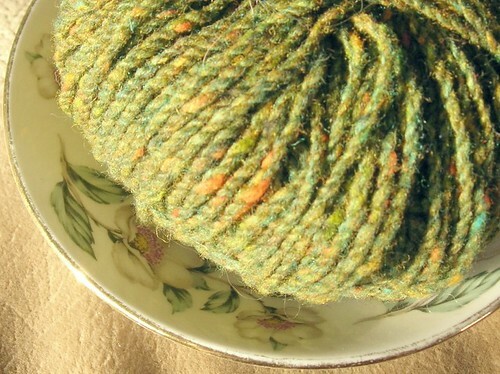 I love this lofty, woolen spun yarn. 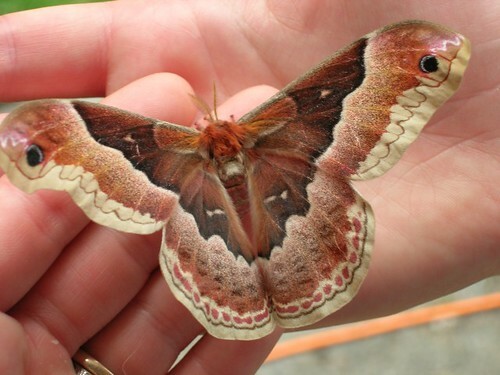 I find it is soft, comfy, and great for showing textures like lace. I’m recommending 149 yards for the smaller size to take into account possible issues with gauge, your gauge swatch, how long the ends you leave are… But I recognize that may seem silly with a 140 yard skein. I actually knit my pair out of a single skein – but I had less than 3 yards left over (and that’s using up the yarn from the gauge swatch) So you can try and use just one skein, but consider yourself warned! You can favorite and queue Tea Time on ravelry, and just like the other patterns you can purchase it on its own, or with the whole collection. When you buy the collection you’re getting all the existing patterns AND you’ll automatically get an update when new ones are released. Just about everything in this photoshoot came from my great grandmother – Grammie Grant. I knew the tea cups were hers, but didn’t realize the clock I’d chosen was as well. Then as we were preparing for the shoot my mom came up with the pretty embroidered table runner and the old family silver – both of which came from boxes saved from her apartment as well. Thus, grateful thanks to Elsa Grant! 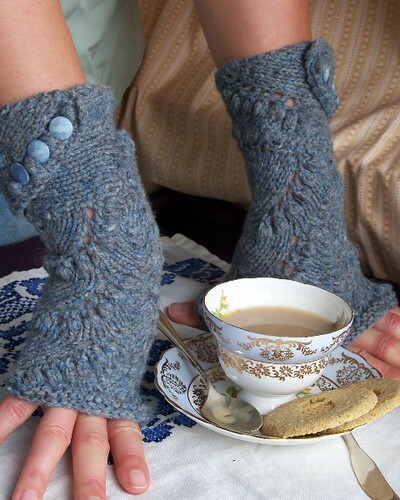 Who probably would have been amused to see all her things assembled into a knitting photoshoot centered around tea. *sadly these got cut when I realized I didn’t have a good design idea to match the name, and when I realized I couldn’t really do a collection of 12 patterns. Yes, originally I thought I was going to have a pattern for every number on the clock face! 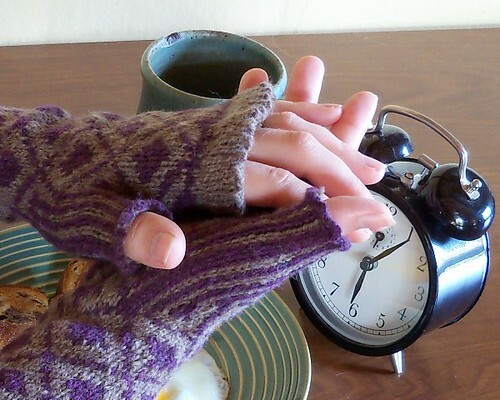 **I’m having serious cognitive dissonance right now between the number of fingerless mitts my brain THINKS I’ve published, and the number actually out… That’s a hint – there are more coming! Knit camp was, once again, everything I hoped it would be! Well, monday was a bit wetter than expected, but we survived. At some point in the weekend one person said something, and I realized how very true it was. 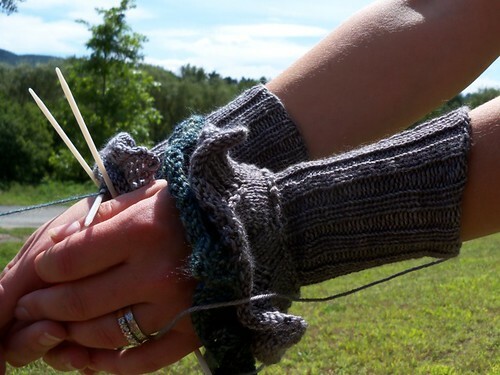 Knit camp is a perfect example of how these funny online communities we form (communities where we don’t actually know each other in real life at all) can be extended, expanded into real communities where we look forward to getting together and seeing each other. Even if it’s just once or twice a year. It was warm enough that for the first time we actually put our knitting down to go swimming! The lake is beautiful and clear, the beach is sandy, and the water is wonderful! 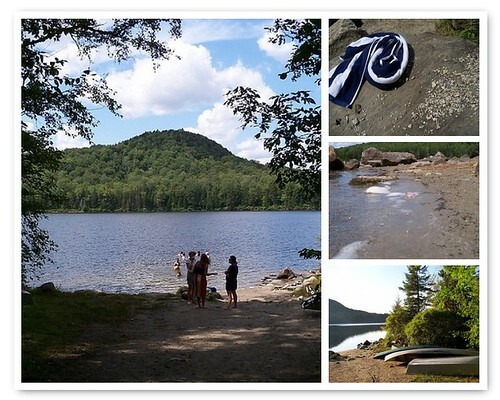 The state park, Kettle Pond, is set up just for groups. So we have lean tos all in a cluster with a central fire pit. 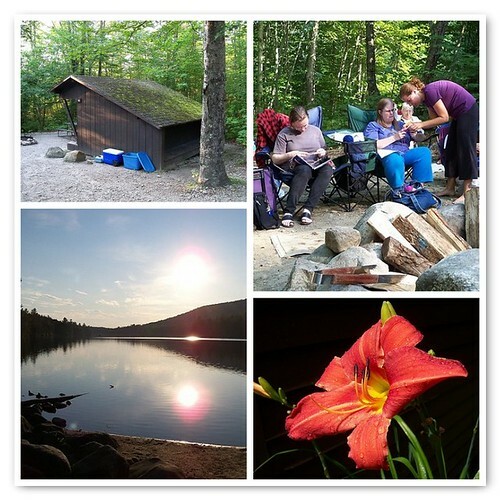 It’s beautiful and secluded and a great place to hang out with other knitters! 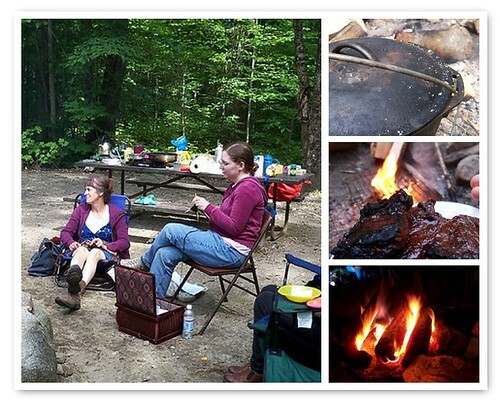 The company, the food, the uninterrupted knitting time* I love knitting camp!